Lithuania celebrates Independence Day of 1918. It became free of Russian and German rule. People celebrate this day even though Lithuania was annexed into the Soviet Union in 1940. In 1991 Lithuania became the first nation to break away from the Soviet Union. According to the CIA World Factbook, Lithuania is slightly larger than West Virginia. It borders the Baltic Sea, and Vilnius is the capital. A member of the European Union, Lithuania depends on agricultural products, including grains, potatoes, and flax. First fruit tree patent was granted in 1932 to James Markham of Stark Brothers Nurseries and Orchards in Mississippi. The patent concerned a peach that ripened later than other varieties. Nylon was patented in the United States in 1937. Walter H. Carothers, an employee of DuPont, patented the amazing synthetic polymer. 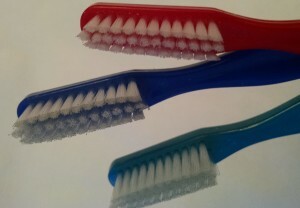 One of the first applications was to replace hog-bristle toothbrushes with nylon-bristle toothbrushes. South Pole Telescope saw first light in 2007. Scientists using the ten-foot diameter telescope are seeking data regarding the history of the universe, dark energy, and galaxy clusters. The telescope is located on a South Pole plateau two miles above sea level. The air there is so dry that the area is desert-like. Robert Joseph Flaherty (born Iron Mountain, Michigan, 1884; died Dummerston, Vermont, July 23, 1951) is known as the “Father of Documentary Motion Pictures.” He started out making silent films, including the 1922 Nanook of the North. Later he made sound films. The Land demonstrated erosion effects. Carol Gorman (born Iowa City, Iowa, 1952) has written at least 22 books for children. Her books include The Miraculous Makeover of Lizard Flanagan and Chelsea and the Green-Haired Kid. Children can visit her website at: http://www.carolgorman.com/.